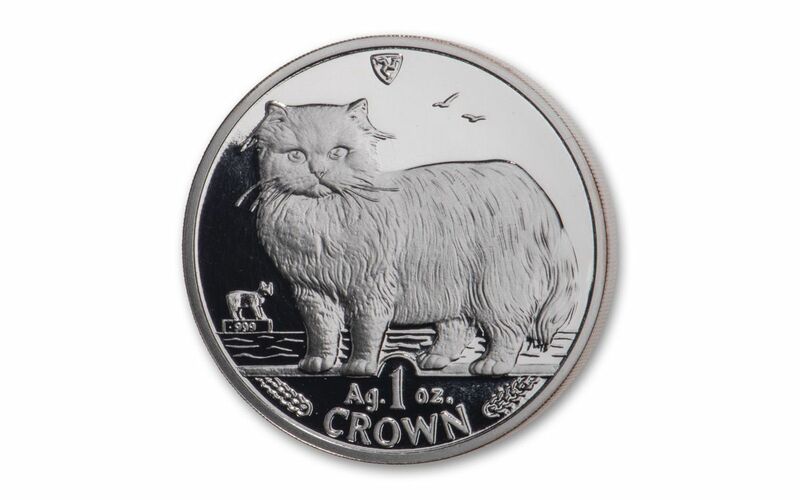 Now you can add the key-date second year coin in the series to your collection with this 1989 Isle of Man Persian Cat Silver Proof. Struck in a Troy ounce of highly-pure 99.9% silver, this legal-tender coin bears a denomination of 1 Crown and celebrates the unquestioned “supermodel” princess of the cat world. Expertly crafted by the artisans at the Pobjoy Mint, the coin’s proof finish is the result of hand-selected planchets, polished dies and multiple strikes to produce beautifully frosted details rising over mirror-like fields. Thanks to their round faces and short muzzles, Persian Cats are often thought of as being snooty and stuck-up. Appearances can be deceiving, however, as the long-haired Persian is one of the most popular cat breeds in the world both for its elegant good looks and its sweet, gentle personality. As their name implies, these cats originated in Persia and Iran and it is supposed that they made their way westward in dusty caravans that brought rare spices, silks and jewels to Europe. Using every bit of their feline charm, Persians have ingratiated themselves into the hearts of cat-lovers around the world by assuming the mantle of being the ultimate lap cat. 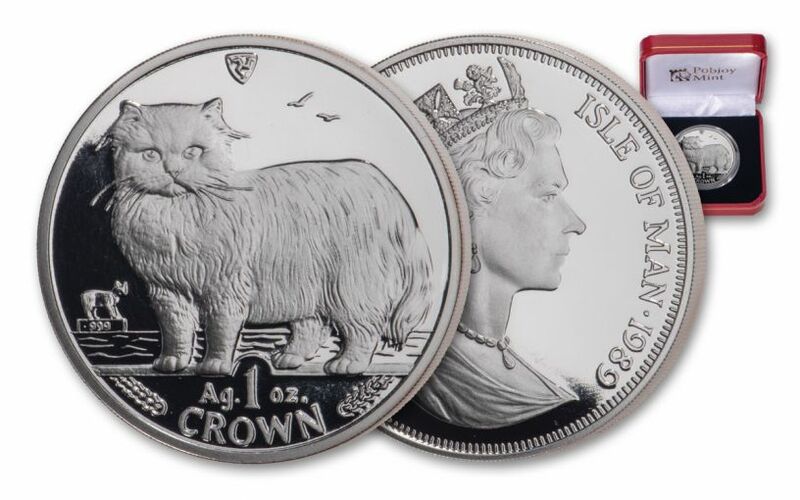 KEY SECOND YEAR OF POPULAR SERIES – The 1989 Isle of Man Persian Cat Silver Proof is the second release in the Pobjoy Mint’s popular cat series that ran from 1988-2016. The coin’s reverse depicts the Persian cat, a breed recognizable for its long hair, pansy-like face and short muzzle. The coin’s obverse features a profile of a young Queen Elizabeth II. 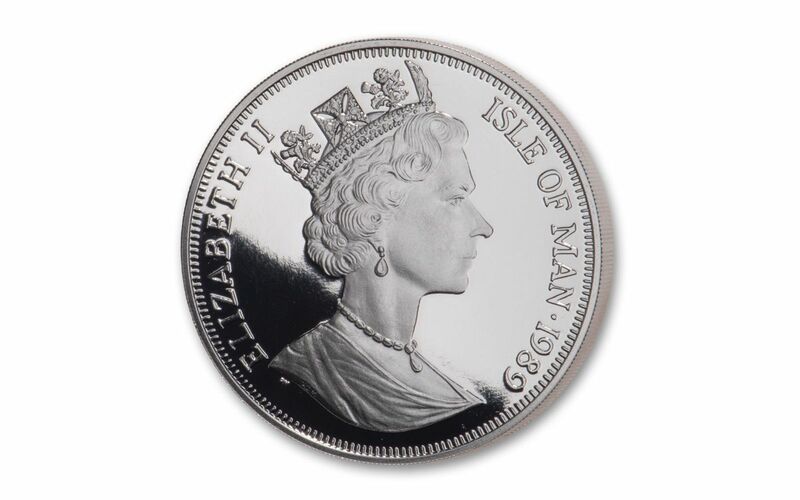 STRUCK IN HIGHLY-PURE SILVER – Each 1989 Isle of Man Persian Cat Silver Proof is struck in one ounce of highly-pure 99.9% silver. GORGEOUS PROOF CONDITION – Your 1989 Isle of Man Persian Cat One-Ounce Silver Proof was expertly crafted by the artisans at the Pobjoy Mint from hand-selected planchets, polished dies and multiple strikes to produce beautifully frosted details rising over mirror-like fields. 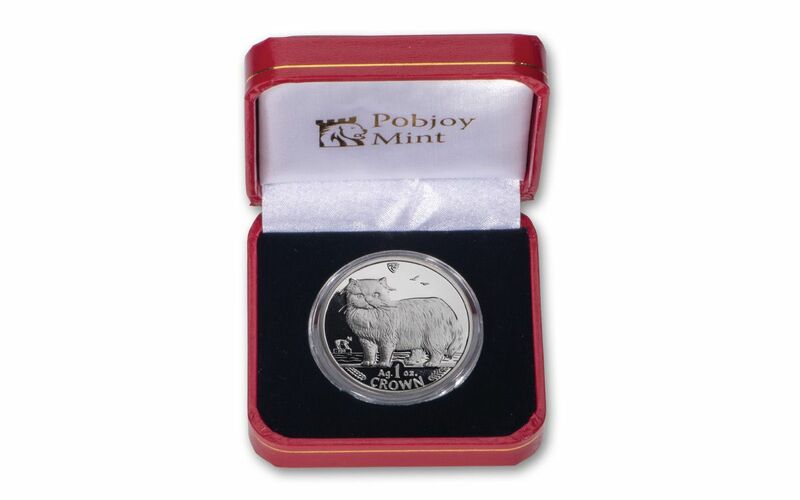 There are only a limited quantity of 1989 Persian Cat coins left in the Pobjoy Mint’s vaults. Once they are gone, no more will be struck – ever. Don’t miss out, order yours now!